One of the kids asked me if I’d go on a walk with them last week. 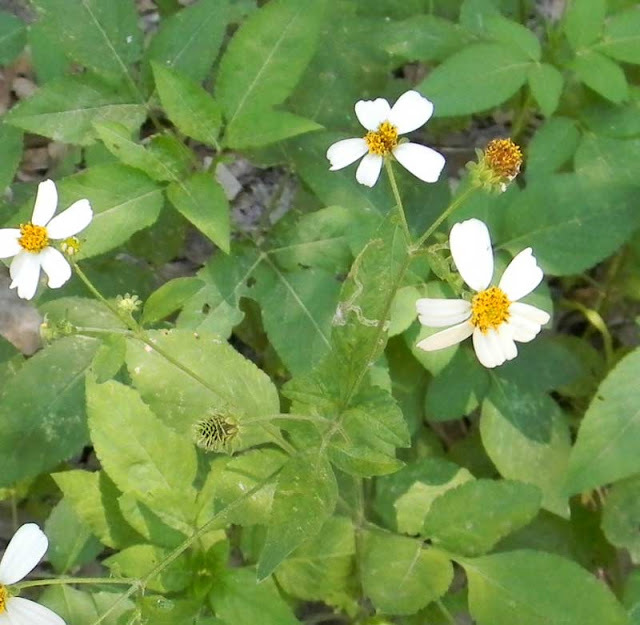 Being a great dad, I said yes… but before I left, I had a thought: why not bring a camera and take photos of the many wild edible plants within a couple blocks of my house? Granted, I live in a rural neighborhood. However, even in suburbia there are often plenty of chances to snag something tasty while strolling – particularly in Florida. Sauteed, boiled, or steamed… these are a good green. They’re also everywhere in Florida. If you can ID them, you won’t starve. We got buckets of nuts from that tree the year before last and the kids spent weeks hitting them with hammers and bricks and eating the tasty kernels. Though they’re really a pain, labor-wise, the nutmeats taste as good or better than pecans. What’s that thing, you say? It’s a beautyberry! They’re blooming right now and it’ll be a few months before the berries are ready… but it’s good to ID where they are now so you can hunt ’em up later. Recognize that? It’s a bay tree. One of the multiple varieties that grow here in Florida. Laurel wilt disease has wiped out quite a few, but there are still many healthy ones scattered through the woods around my house. I hope they’re disease-resistant enough to continue. Anyone know what this next plant is? Aww yeah… wild grapes. There are plenty of blooms this year so I’m hoping for a bumper crop of tart muscadines so we can make jam again. Last year’s turned out great. They’re not very good right off the vine – but for processing? Awesome. That scary-looking thing is a Zebra Longwing Gulf Fritillary caterpillar. 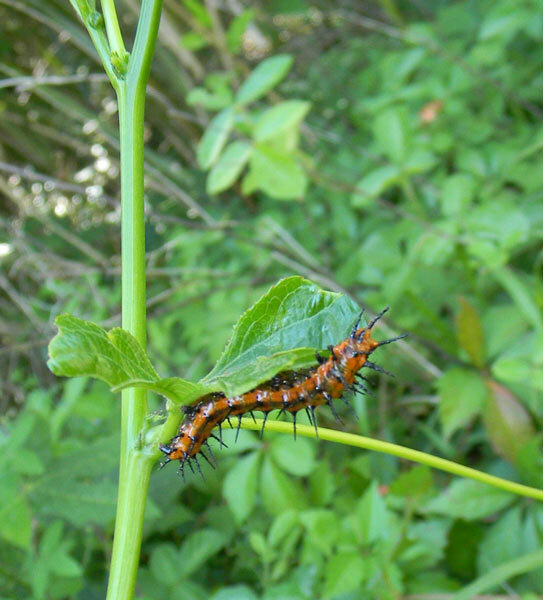 Most ornamental gardeners plant passion vines in their butterfly gardens just to get these spiny orange and black monsters to show up – along with the spiny white and orange Zebra Longwing caterpillars. Not me… I want fruit! 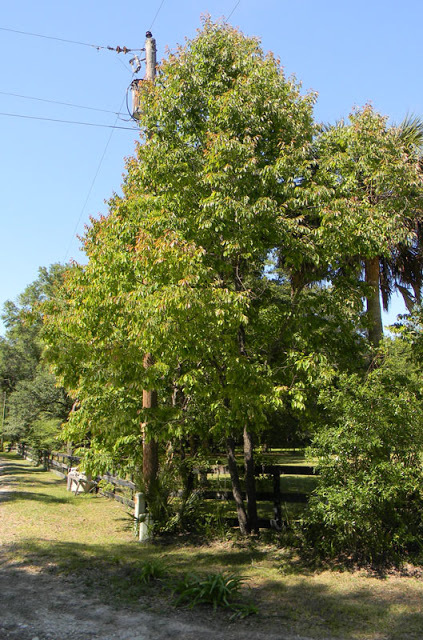 And, speaking of fruit… recognize this tree? I wouldn’t be able to pin down the species unless I saw it up close. Maybe this will help you? See the little green fruits? Wild persimmons! We ate a bunch of persimmons off this and a couple of other trees last fall… and I planted the seeds right afterwards. A few weeks ago I was rewarded with about a dozen sprouts… but that’s something I can share in another post. 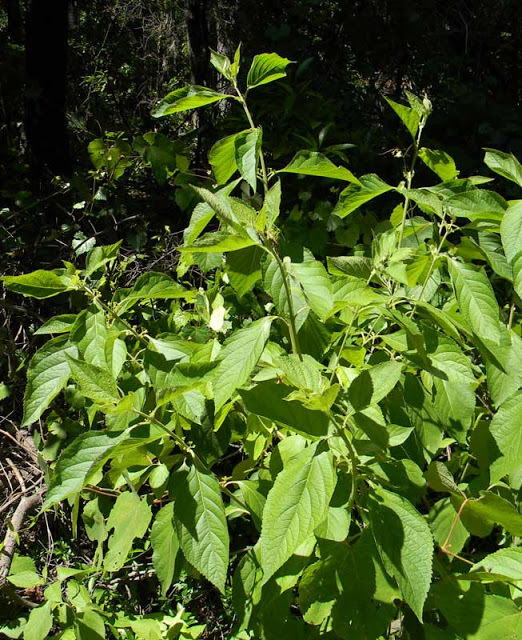 A member of the Euphorbiaceae family, also known as the “spurge family,” that there is a Cnidoscolus stimulosus… the “tread-softly” plant, also known as the “spurge nettle.” It packs a nasty sting… and an edible root… like its cousin the cassava. 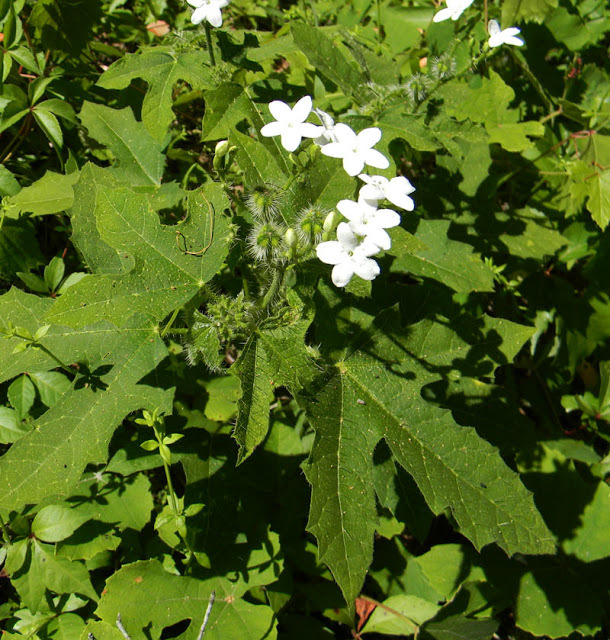 It’s also related to the delicious chaya… though I’ve never discovered if tread-softly leaves are edible. That’s a smilax shoot. Break off the top eight inches or so of new growth, steam or sautee in butter, and the taste is a dead ringer for its cousin… the asparagus. 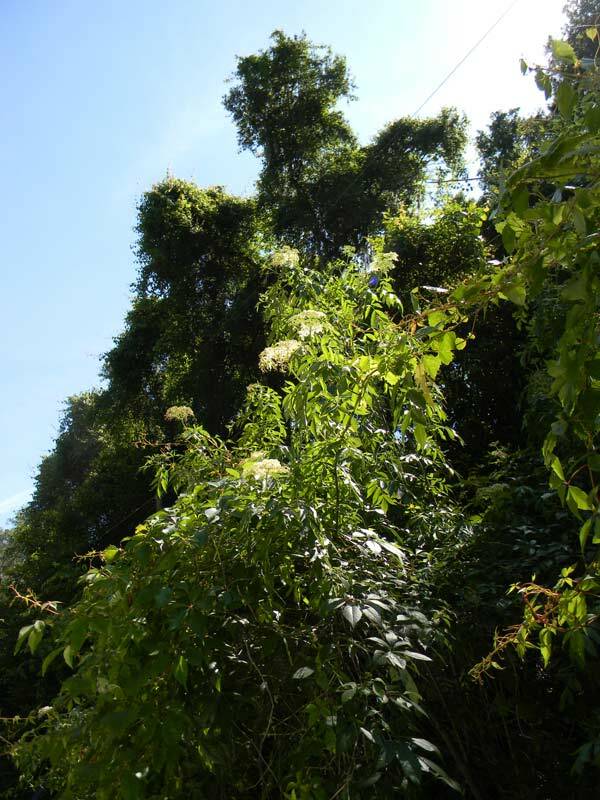 (NOTE: these are also called “greenbriars” or just “brambles.” The vines are covered in vicious thorns, unlike the young shoots. Later in the year they can make the woods almost impassible. 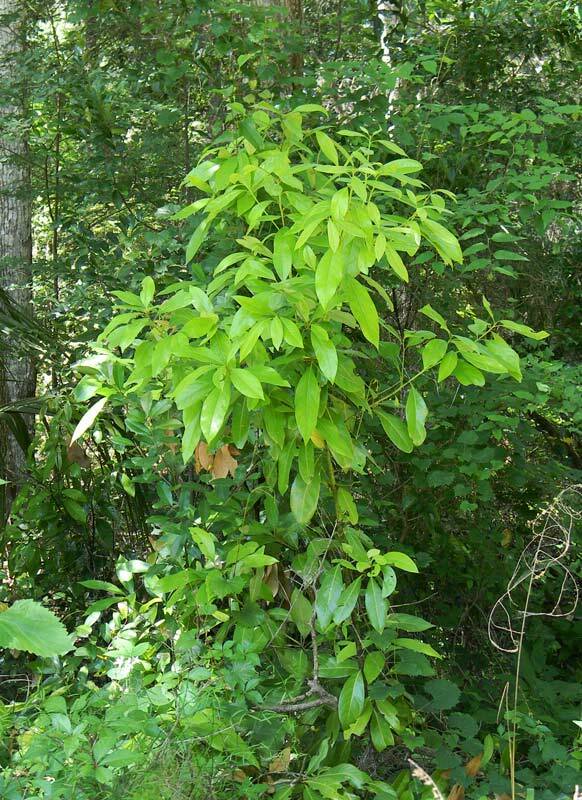 My daughter tells me they should be named “frownax” instead of “smilax,” since they’re always scratching you up!). 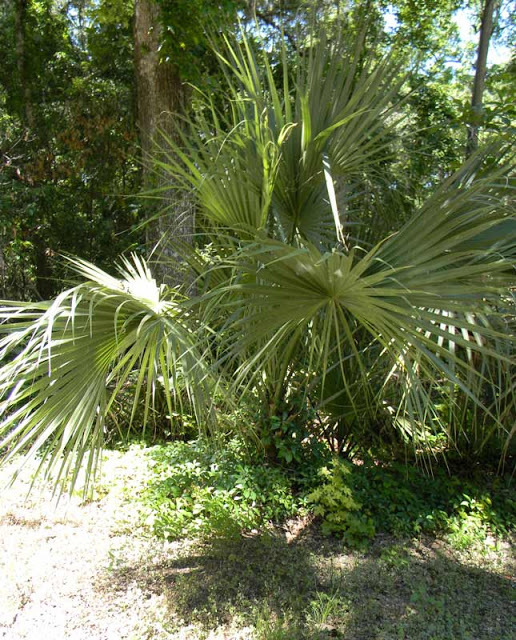 Yep – it’s a cabbage palm. They are everywhere here. The fruits are edible and sweet, though they have almost no flesh. Roasted, you might be able to grind the seeds… but otherwise, they’re like buckshot. The heart is edible but that requires killing the tree. If I had plenty of land, I’d harvest them selectively and let the birds replant. They take a long time to get to any size. 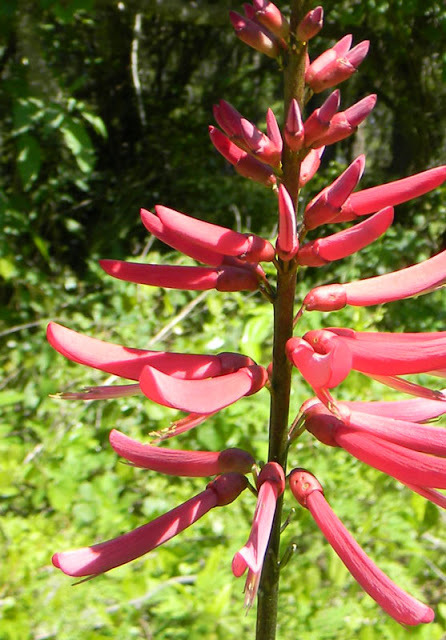 Those are coral bean blooms (it’s also known as the “Cherokee bean.”) The beans it produces are bright red and poisonous – DON’T EAT THEM! However, according to Green Deane, the blooms are good if prepared correctly. You can find details here. I don’t eat them, personally, but I do plant seeds and start plants around the base of my fruit trees to add nitrogen to the soil. Yep, they’re a nitrogen-fixer. 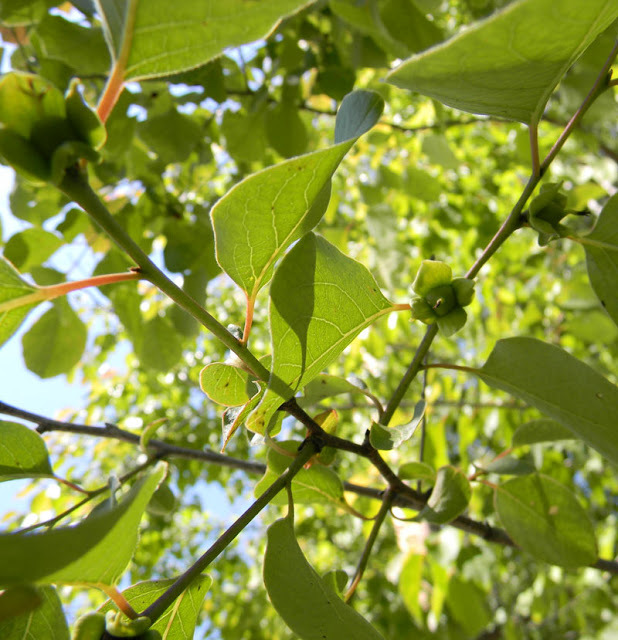 It looks like a mulberry… but that’s actually a basswood tree. 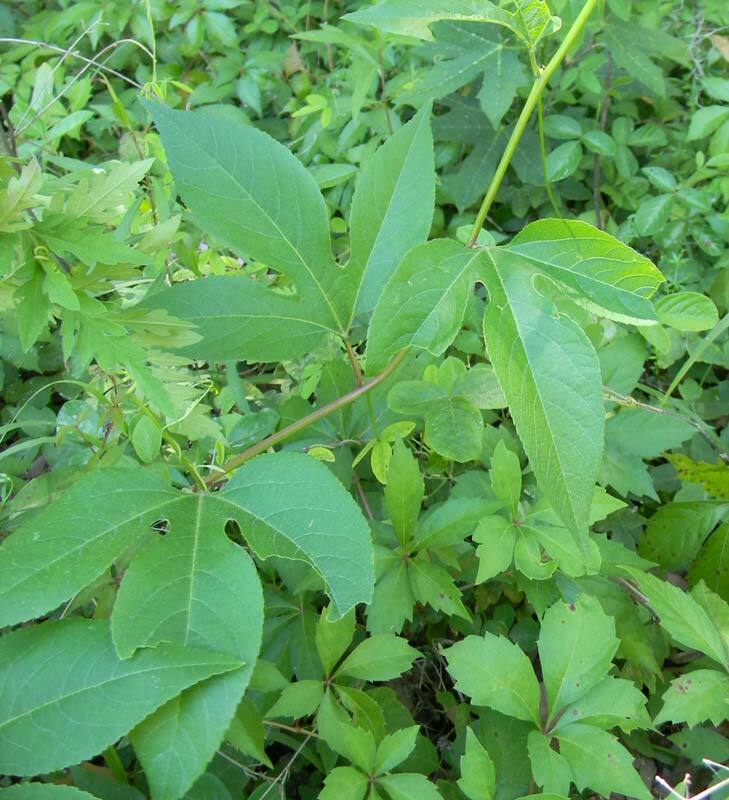 The leaves are excellent food for livestock and people. I just recommend eating the really young leaves when they first appear, otherwise the texture is rather coarse. Your goats won’t care, though, so give them the big tough ones. Elderberries! There are a couple of dense wild stands just around the corner and they’re in full bloom right now. 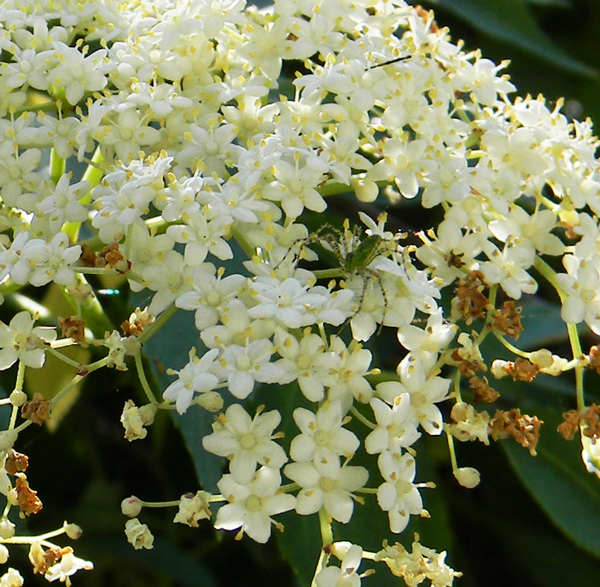 The blooms can be made into tea… and the fully ripe berries are edible… but the rest of the plant is totally toxic. So don’t go eating elderberry-leaf salads, okay? Now get out there and have some fun in the woods! Must-have Wild Mushroom Foraging Books! 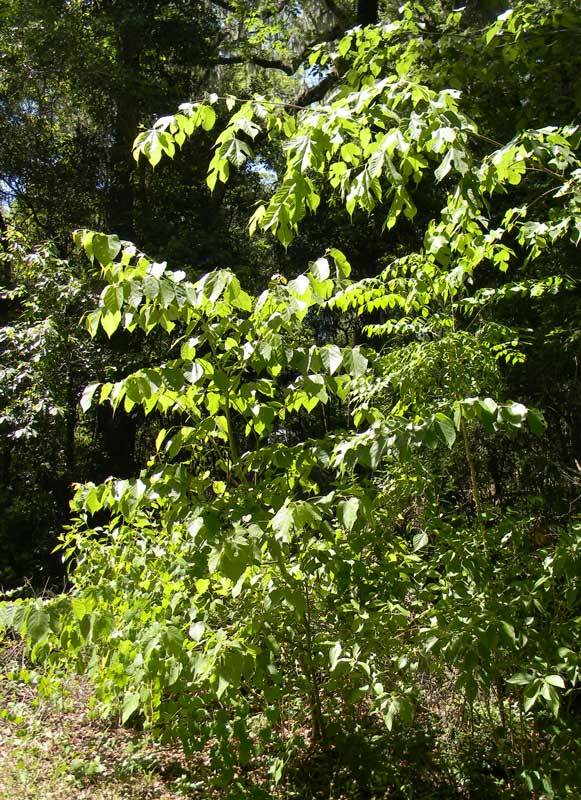 Nice article… I recently had someone call me and ask me to identify edibles at his house… Wasn't much, back yard was covered in privet… Pretty much just the smilax, and the next time I went there… No smilax! The white and black spiky ones turn into zebra long-wings – the orange and black spiky ones are frittilaries. As for that borderline edible/borderline kill you bean, that's not the same as the rosary pea, though the seeds are similar. The rosary pea is one of the most poisonous plants on earth, if not the most poisonous. This one is poisonous… but not to the nuclear level of rosary peas. The dog looks like he could use a few edibles himself. Looking rather thin in the skin, there. I love that we have plenty edibles in the wild. It's a great thing. As for passionfruit, we make juice out of it and strain the seeds. Easy enough and it's good, though the seeds are edible. Funny, I lived in Florida before moving here and never noticed the edibles in the wild. Now, that I garden for food, I look around for wild edibles. It's really tasty, though our native ones are apparently not nearly as productive as Passiflora edulis, the "true" passion fruit they use in South America. This morning my city fumigated my neighborhood for mosqutoes. I have multiple trees with small budding fruit. How will this effect my fruit? Thank you for stopping by, Kathy. 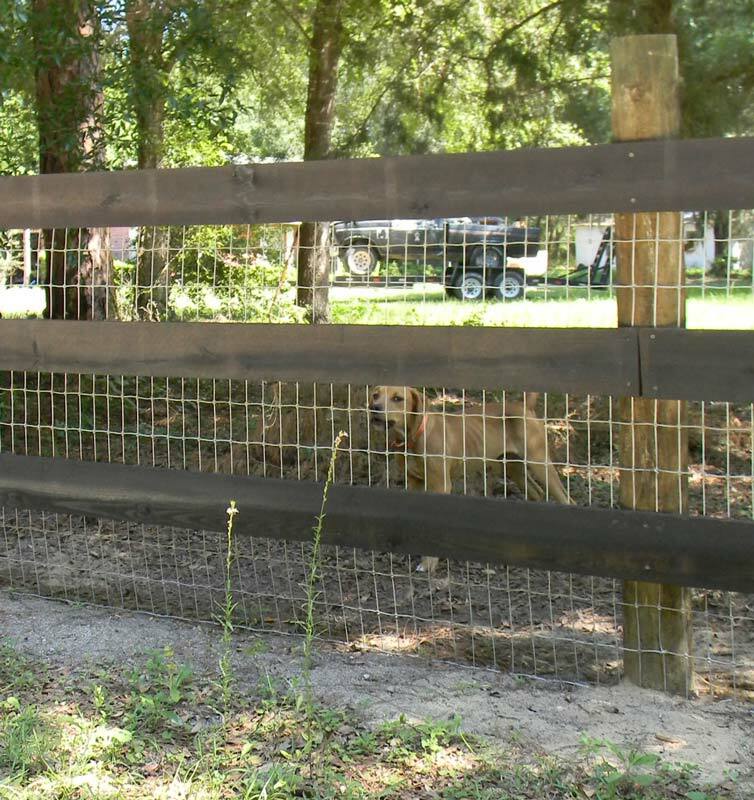 And boy… don't you hate the mosquito spraying? Sometimes it's necessary, like when you're dealing with malaria or other diseases… but I really get the heebie-jeebies around clouds of pesticide. It also poisons a lot of other insect life, which is really uncool. It's supposed to break down quickly… though I've heard that refrain before. If I were in your shoes, I'd go outside and spray all the fruit trees down with plenty of water so the developing fruit doesn't grow around the minute amounts of pesticide on its surface. I can't say for sure if that will get rid of all of it – or if it's even necessary – but I would feel better about my own trees if I at least took a shot at flushing the stuff off. I know that some pesticides on the skin of fruits can get inside the fruit as it develops. Greenbriar is edible? 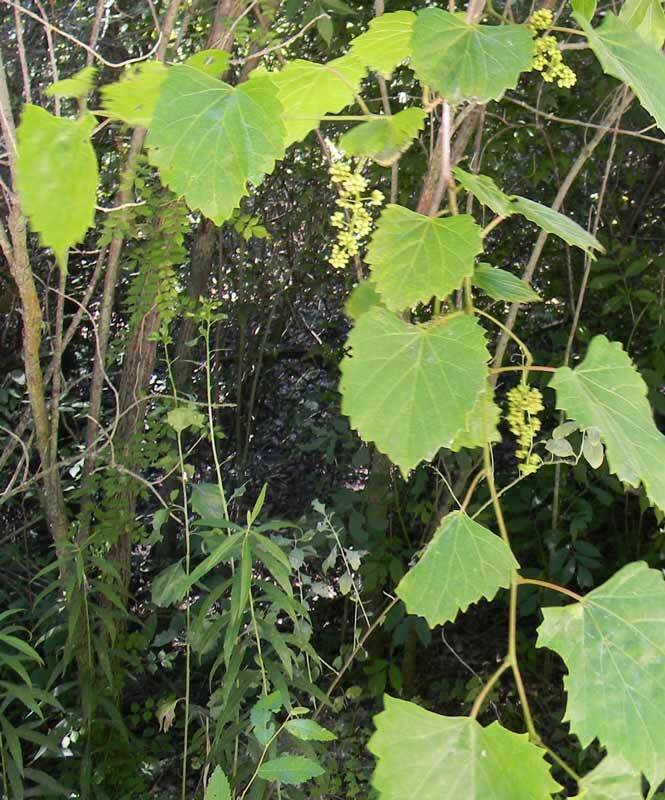 I have classed that as second only to poison ivy in my list of vines I don't want on my property, but have anyway. It's a late comer, probably appeared around ten years ago. As soon as I saw that it was a vine AND a thorn bush, I knew I hated it. In the past year, the place it was growing has been totally demolished and turned into a rock wall, so I don't expect to see it again. It was a bit too cold for it here, anyway. Oh yeah… very edible. It's certainly nasty to clear… but it's also one of the few wild edibles I actively seek out and harvest when it's in season. We get it all through the spring here – lots of great new growth. On multiple occasions I've wandered through the woods for an hour to gather a few pounds of it. Great post. I grow a number of these to attract birds and butterflies. I know the mockingbirds love the beauty berries, but I didn't know they were edible to us humans. Googled it (LOL) – seems it makes a good jam. I'm with Jean on the skinny dog. My chunks could sustain us for months. Man, I feel guilty just typing that. Thank you. I thought it was really cool that beauty berries were edible. My kids eat them all the time, though I find them too bland to be worth eating. Apparently they come into their own as jelly. I keep planning to try it and then not following through. Maybe this year! If I do it, I'll post pictures and a review of how it tastes. I can help with the Dog recipe, bay has been hard for me to ID but the rest i look for while out in the field, always good to refresh on the basic edibles. 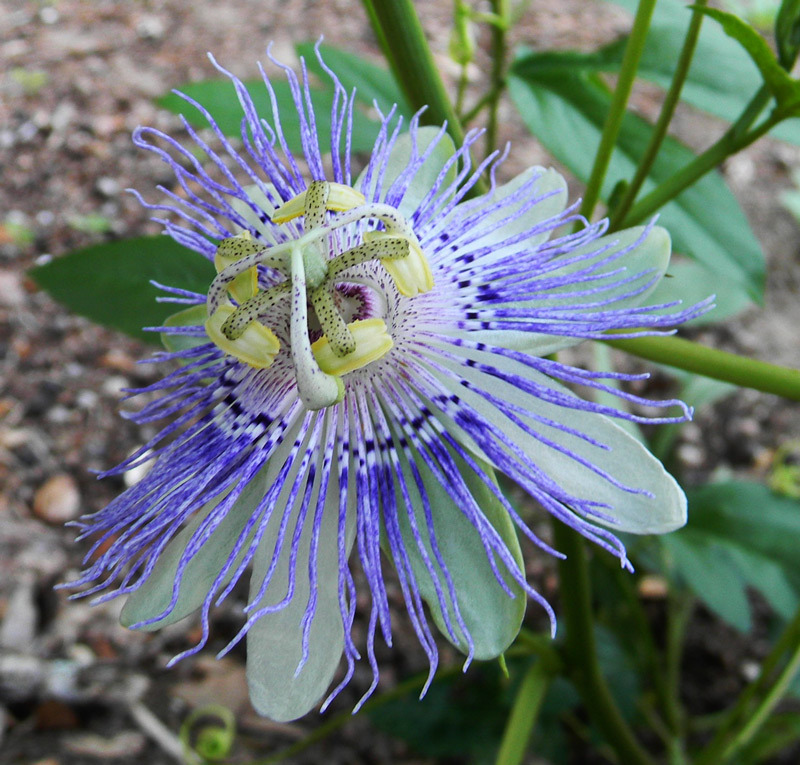 Is there a non producing passion vine? I have had several passion vines & never any fruit…??? Why did you put a dog into such a nice educating article….Totally Disgusting!!! Thank you. A good Earth citizen. I have several of the plants in my yard and will be adding them to my menu. I surely hope you’re not serious about the dog because that’s totally disgusting and ruins your otherwise interesting site. Totally and completely serious; in fact, my wife has a whole shelf of cookbooks dedicated to the proper preparation of succulent dog meat. I second your comment. How repulsive for someone to comment on ” wild edibles” and include what our society recognize as loving pets. If my brother was an officer in his county, I’d send him knocking. No, they need to get a sense of humor, or better yet grow a brain. I had a good chuckle at that, and pretty much thought about my husband threatening my chunkbutt pitbull with grilling if we were starving! I told him he’d have to learn to like fish first, when all those were gone then, and only then, could we entertain thoughts of other food sources!! Also, great article, I enjoyed ALL of it! Some people need not be so literal. Thank you, Brandi. Two green thumbs up! Note: basswood is also an excellent wood for making electric guitar bodies. Very smooth and resonant. just thought you might like to keep that information in mind. I WOULD LIKE TO GET INFORMATION ON A CLUB IN THE BAY COUNTY AREA THAT MEETS EVER MONTH AND TALKS ABOUT EATABLE PLANTS IN MY AREA. I have a question regarding nitrogen fixers. 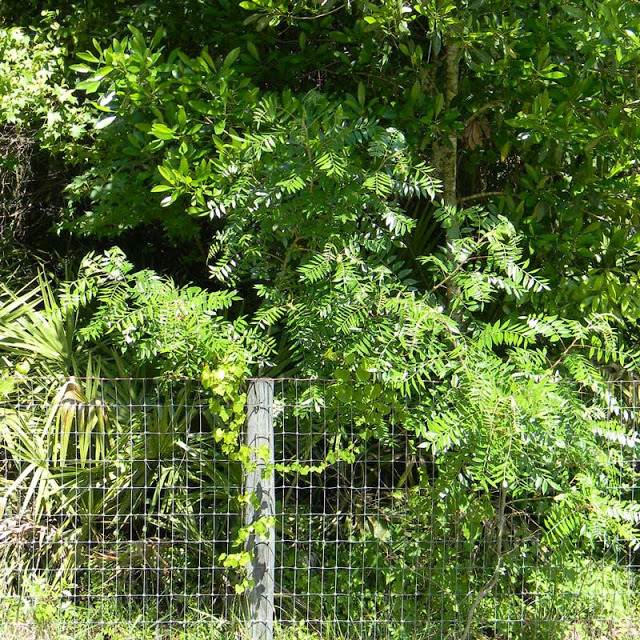 I live in SW FL and have tons of Brazilian Pepper trees on my property. Would they be good as nitrogen fixers? I plan on chopping them down any way, would those leaves and branches be good to pile around and in my fledging food forest? 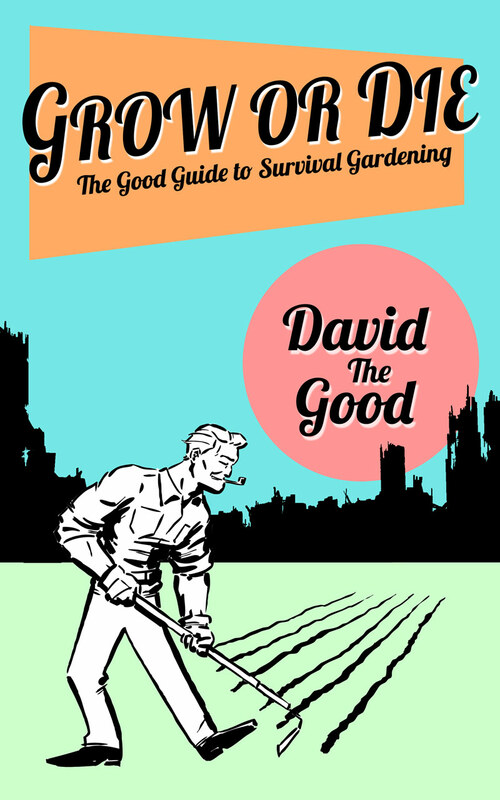 I enjoyed your book, “Create Your Own Florida Food Forest.” Now I’m working to implement your ideas. They are not a nitrogen fixer but I think they’re a good “chop and drop” mulch source, so long as you can keep cutting them down before they set seeds. 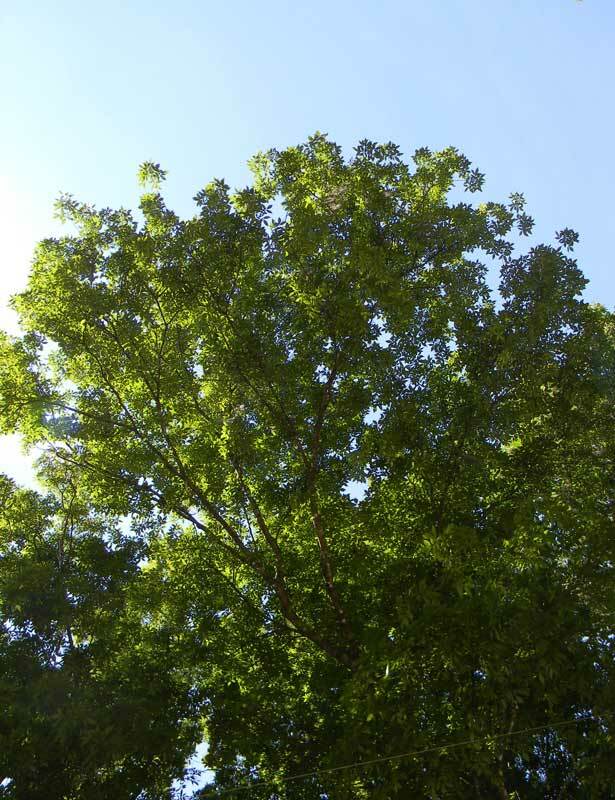 Cut, they grow back, cut again – great tree for that. Just don’t burn them as the smoke can mess you up. 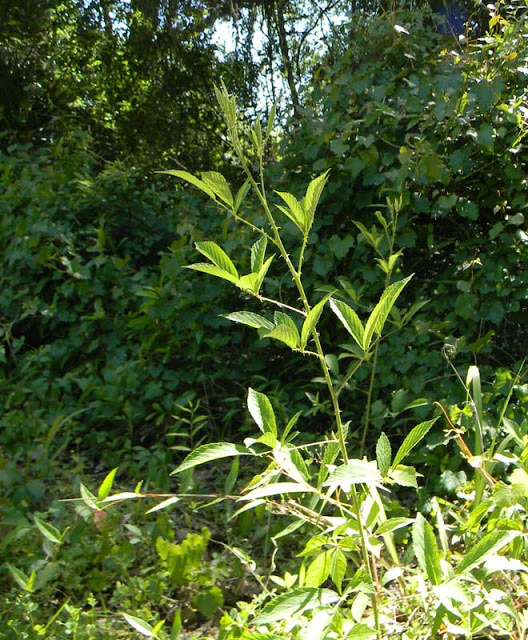 Brazilian Pepper Trees have been studied as a treatment for MRSA and other infections. I saw it mentioned on a National Geographic show and looked it up in Google Scholar. I managed to pick some remaining berries that the robins missed. I might make a tincture of leaves and one of berries, and dry some berries…just in case…. Love your article! Where can I purchase your book? I want to be sure I’m not harvesting poisonous plants LOL! I’ve always been a “survivalist” and am slowly building up my supplies. 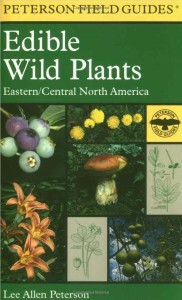 I don’t have a book on wild foraging. About that Cabbage Tree, sometimes it will keep growing, it matters how and where it is cut. But if it dies, there will be 2 suckers that is in the ground that grow up fine. That is called Swamp Cabbage, if your an ole Cracker like me and know what to do with it. Good Luck. I’ve never heard that the cabbage palm (Sabal palmetto) will survive being cut; it only has one growing bud, which is eaten when harvested for cabbage. 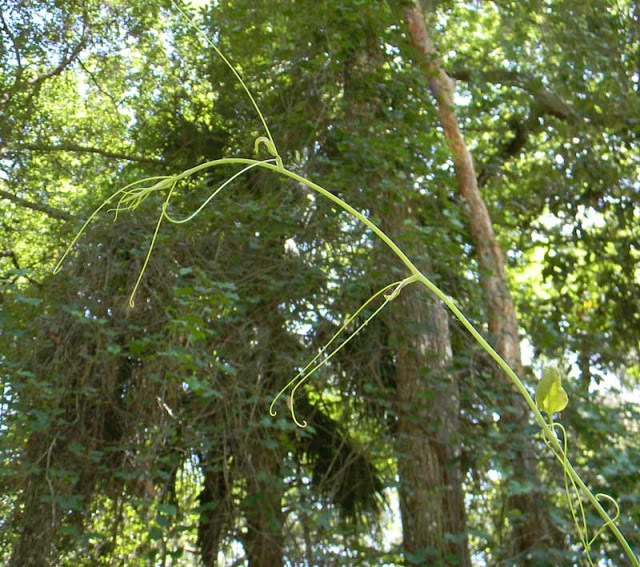 The swamp cabbage you might be referring to is the saw palmetto. According to Green Deane “The terminal buds of the growing trunks contain heart of palm just like the cabbage palm does except it’s smaller. Taking it from the saw palmetto does not kill the many-trunked palm.” (http://www.eattheweeds.com/saw-palmetto-saga-3/). Thanks for stopping by – we don’t have enough old Crackers in the state. Too many Yankee immigrants at this point. I’m not necessarily an ‘old cracker’, depending on who you talk to, but I’ve never seen or heard of cabbages growing back either. I grew up along the Suwannee River eating plenty of them throughout my childhood, raw of course, I never liked them cooked. I still don’t care for them cooked, but I do still love them raw, unfortunately you can no longer harvest them like you could in the ‘olden days’ as my 16 year old daughter calls them! And I completely agree, we native floridians are a dying breed! My children prefer cabbages raw as well. We usually have a few in the fridge, though I’ve had marginal luck growing them in the tropics where we live now. I grew some great ones in Florida. 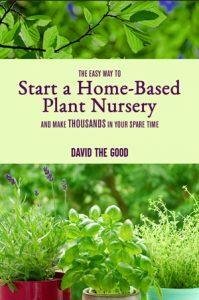 Great article–and thank you for reference to the Peterson handbook–maybe with these photos and that book we can safely start to sort out the plants. Im always worried we will eat something we shouldn’t, and it be along that “nuclear poison” level plant. One thing you can do is learn the really dangerous plants first – there aren’t a ton of them. From there, you can have a little more confidence. Woof woof. Eat plants, not poochie. You’re sick, I like that…even though I don’t eat animals myself, I prefer people. 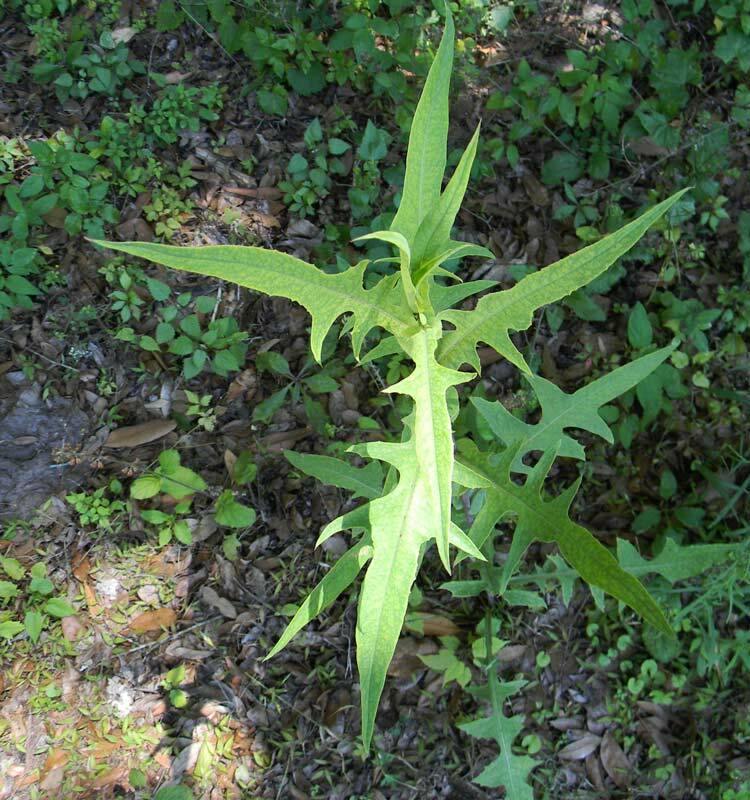 If I were to gather plants, usually small starter plants, from the side of a road, ditch, or water runoff area of unknown pollutants, would the toxins/contaminants ever grow out especially from the smaller starter plants and also if they went to seed would the seed and subsequently the plant that grows from the seed also be contaminated? My name is ChrisT—not CHRIST. Just clarifying as it capped all the letters. I fixed your name, too. The offspring of those plants would be fine, Chris T. I would also not worry much about them once they grow up. 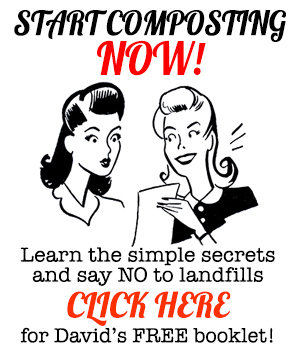 Yeah, they’ll still have a little of the contaminants, most likely, but not much.